The moment I saw this recipe in Sherin's Kuk's Kitchen, I told myself I'm definitely going to try this but I have made some changes to it. But no much changes but I didn't add chicken to this dish as the recipe calls for as we get a lot of vegetarians guests for Diwali. Sherin, thank you so much for sharing this recipe with everyone, the taste was awesome. Dry roast and blend all the ingredients for masala and keep aside. Fry raisins ans cashew nuts in ghee and keep aside. Fry sliced onion until crispy golden brown and keep aside. I have used rice cooker to cook this dish, pour ghee and fry cardamom, cinnamon, cloves, ginger garlic paste, green chili paste fry for a minute then add washed rice and fry together in the ghee. Pour water, yoghurt, lemon juice, rose water, crushed pineapple and let rice completely cook until fluffy. Finally add a few drops of saffron with milk and garnish with fried onions, cashews, raisins, coriander and mint leaves. 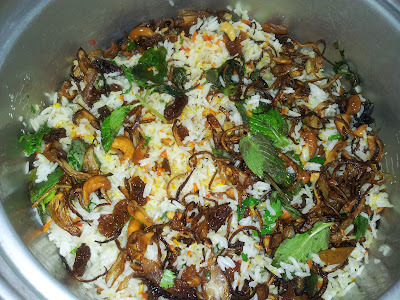 Now our Keralan Briyani is ready to be served, do try and let me know how it turned out for you! Looks yummy dear. Thank u very much for trying my recipe and linking back dear. thanks arthy, I have been refering to u as suman ;-) sorry dear.